If only they knew. The treat lady can't make it this time. Eddie, above, seems oblivious but Bubbles can't stand the news. I have to admit I'm siding with Bubbles but she really needs to stop shedding so much fur. I wish you a very happy new year and hope you, your families and friends have a wonderful 2010. The queen in the UK used the Latin phrase "annus horribilis" to mean a "horrible year". I was never taught Latin so please correct me if I get this wrong, but this has been a "septimana horribilis" (horrible week, or seven days). Hey, I'm an ex-state school kid, you should be surprised I know there's such a thing as Latin and not robbing old ladies of their handbags. Please give all your thoughts and prayers (if you're religious) to Pam. She and I both have pretty crappy Christmases to look forward to and I know Pam will feel better if she has the thoughts and encouragement from all of you. It will mean a lot to me as well if you could drop her a line or a comment wishing her well. She was going to be here just after Christmas but now cannot visit as she has some serious and urgent medical issues to deal with. I know she will be in my thoughts. In the meantime, thank you all for reading my blog and for all your comments and I wish you all a Merry Christmas and Happy New Year. Thankfully it seems the storm of the last couple of days has passed. One victim is my camera which is broken due to some nearby lightning strikes and wish I had it for my drive between Puna and Hilo yesterday evening (Saturday 19th Dec) because the rain and lightning is something I won't forget. This morning Kona experienced the storms and a particularly powerful-looking water spout. I've seen a few of these on the east side of the island over the years but nothing as big as this one. Big Island Video News - water spout. Big Island Video News - Puna storm. PS. Guess I should make it three videos. The following is from Hawaii 24/7. Watch the top video, especially just after 1-minute as it shows a lightning strike. That was the sort of thing I saw several times on my drive and some very close to me. What is it with my place? The thunder and lightning started yesterday evening and went on until just a few hours ago. Some of the locals are reporting up to 15 inches of rain in the last 24-hours which wouldn't surprise me as my yard flooded again. This never used to happen until two or three years ago. The power has been off and on all day but finally went off at around 4:45pm. I needed to go into town so this seemed the best time despite not being able to take a shower - my water supply depends upon a pump which only works if there's electricity. I'm sorry if I offended anyone in the couple of stores I had to visit. As is normal in what to most people would appear to be a third-world island, there was no way to get through to Helco, the local power company. Their emergency number was busy. Obviously their crews did go out and eventually fix things otherwise I wouldn't be able to post this, but their telephone system needs some fixing. In the end the only causality was my camera. It's had it. I tried to take some pictures of last night's storm but the lightning started to strike trees within yards of my house so felt very uneasy and went inside. Can you blame me? This morning I checked the camera and it's fried. It sort of works as in it will take a picture but it's just noise and the LCD screen shows nothing but white. I think the lightning got it and I'm so glad it happened when I was inside. Just popping by because Brad posted an amazing video on his blog and I hope to share it with people who might not go to his blog too often. It's called The Known Universe and it was made by the American Museum of Natural History. The video is stunning, I hope you enjoy it. In a 24-hour period I learn about the proposed closure of UKIRT and the potential loss of my job and then my closest and dearest friend, who I love dearly and wish she was here right now, has been diagnosed with cancer. As you can imagine my emotions are a touch messed up right now and think it's likely I'll be taking a break from blogging for a bit while I sort myself out. Thank you all for reading and commenting and your thoughts mean so much to me. Hopefully I'll be back here very soon and if it isn't before Christmas then I wish you all a Merry Christmas and Happy New Year. We've received this year's Christmas present from the UK's Science & Technology Facilities Council. Brad at canspice.org has all the details in "The Death of UKIRT". I don't feel like writing much this evening. I cannot say why as the news I have is confidential and so all I'll say is that I'll be making sure my CV is up to date. 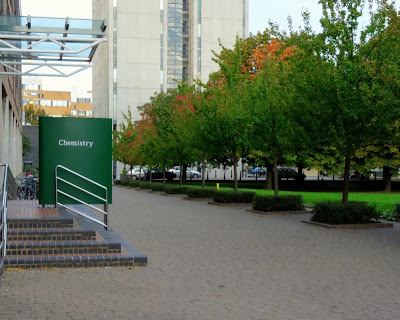 These are a collection of blogs and articles all written before the STFC announcement on Wednesday 16th December at 2pm GMT. They give a flavour of the pre-announcement feelings of the UK astronomical community. I don't think the mood will improve much once the announcement is made. Unlike other more forward-looking governments who understand the benefits of pure science and how it aids society, e.g., attracting people into science to start with and the unforeseeable inventions that is has produced over the centuries, the UK government is cutting back its funding. I could go into a long rant about the UK government such as its support of the banks that had put us all into this dreadful financial mess, how it spies on its citizens, how it supports people with no intention of earning a living yet penalizes those that do, how it screws up student funding so that many have given up their university courses because their loans still haven't arrived and how it wants to become big brother. Tomorrow some of us will find out what cuts the STFC will make, and most of know there will be little good news, if any. I just hope I'm around a little longer and can take a few more photos of Mauna Kea sunsets while the government destroys British science. Yes, I'm depressed. I'm not the only one, as the e-astronomer and telescoper might confirm. 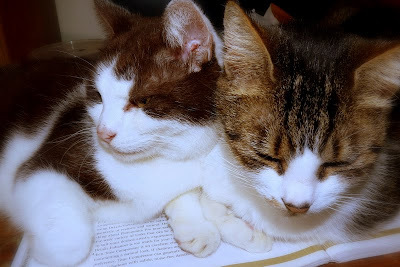 A couple of people have asked me for an update on Bubbles and Eddie, my two cats. They're both doing really well and despite advancing age are quite healthy. I asked the vet recently if it was normal for my two girls to become increasingly annoying as they got older and his answer was "well, they do tend to become more needy". When I'm at home they just won't leave me alone (or each other but that often ends in a fight). No matter where I am they have to be near me. It's very cute but they have both become a little more vocal in the last year. In the past, when they wanted to sit next to me they'd do it quietly. Now they make the most ridiculous noises until they have my attention and it gets a touch exasperating after a while! They are still very beautiful and incredibly affectionate, and both know when I've had enough of them for an hour or two! Eddie (on the right) is 13 years old and is still extremely athletic whilst Bubbles (12 years old) just likes to sleep, preferably next to Eddie, who she still thinks is her mum. I haven't the heart to tell her otherwise. 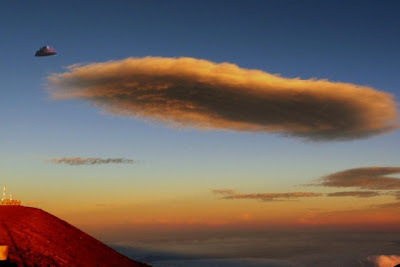 A Mauna Kea summit panorama taken at sunrise. Click on the picture for a larger image. I took this sunrise panorama in October but didn't post the picture here because I wasn't happy with it as there were too many things wrong in the final picture. It shows, from left to right, a bit of the Hualalai volcano, the CSO, JCMT and the SMA in the valley and Subaru, the Kecks and the NASA IRTF on the ridge. In the distance you can see both the earth's shadow and the one formed by Mauna Kea. The panorama consists of three camera positions and at each position I took three shots with different exposures to create three separate "blended" images, one for each position. These three blended pictures were then stitched together in software. Although it's obvious to me, I was the one doing the panning after all, can you figure out if I created the panorama by going from left to right or right to left, and if so, how do you know? 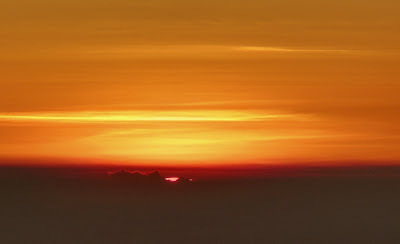 The clue is it's sunrise and the view is to the west! ...or does it just make you say "huh"? 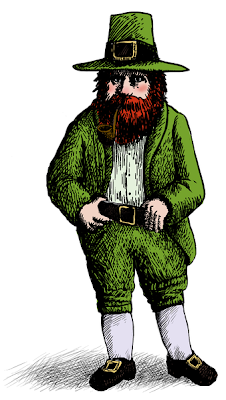 An interview by a fake Irish leprechaun? My my my, this scares the bejesus out of me (written in a fake Irish accent of course). We call it the "top-end" but it's really the secondary mirror with the associated mechanical, electronic and optical components. Unlike secondary mirrors in most amateur and consumer telescopes, the top-end is a rather complicated beast. During night-time observations it "vibrates" at up to 100 Hz (100 times a second) to compensate for distortions in the optical path of light from a star, galaxy or whatever we're observing. The distortions are due to turbulence in our atmosphere. This system, called tip-tilt, can improve our delivered image quality by up to 100% compared to a telescope that doesn't compensate for the atmosphere. 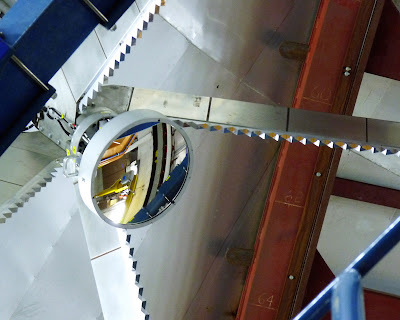 On top of this we also move the secondary mirror to compensate for "flexure". Just about all astronomical instruments that are attached to a telescope suffer flexure. 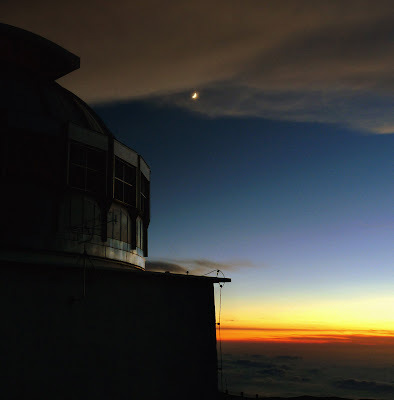 As the telescope slews around the sky the effect of gravity bends the instrument (and telescope) ever so slightly. The amount of bending is minute but it's enough to impact image quality - the detectors in the various instruments are no longer exactly perpendicular to the wavefront (the beam of light that the telescope sends to the instruments) and the result is small aberrations that can be seen in the images of the night sky. These can be corrected in software to a certain amount but always result in a loss of sensitivity, i.e., the faintest objects we detect might just be too noisy to extract a scientific result or the image of a star isn't quite round enough to to see if it's a point source or slightly extended which means it might have some interesting circumstellar material around it - perhaps even a new solar system! Our top-end is one of my responsibilities and I spent a lot of time coming up with a way to compensate for flexure in our current survey instrument. The secondary is moved in both the translational axis (i.e., from side-to-side) and in the rotational axis (i.e., it tilts) to correct for the flexure. The work resulted in a significant improvement in our delivered image quality, or as some might say, the "seeing" (although that would be a bit of an inaccurate way to describe things). Unfortunately, the top-end is being asked to do a lot of work and occasionally just seems to give up and stops moving. The tip-tilt still works but the flexure compensation stops (they are controlled by different systems). It's an annoying problem although it's quickly fixed at night so rarely loses much time, but it does often mean we have to stop observing for a couple of minutes to reset things. At the start of this week one of our engineers played around with a spare controller for the top-end and then put the original back in place. That's always a bit of a pain because it means things get reset during the day and the mechanisms that move the top-end are sensitive to temperature. During the day things are warm and at night it's cold, so any daytime work on the system means we have to reset things at night when the temperatures have settled. Well, it turned out that swapping the controller and then putting the old one back in place fixed things. For two and-a-half nights we experienced no problems at all with the top-end whereas normally we'd see the problem two or three times each night. I was so happy! Being confident things had been fixed albeit not sure how, I sent a message through our fault system describing what had happened and that it appeared things had been fixed even if it was serendipitous. I believe it was within one hour of my happy and relieved response in the fault system that the top-end stopped working again. I've a bit of a dodgy knee and have been stuck at home for the last couple of days and had nothing better to do other than sit in front of my PC with my leg in a fully rested position (just in case the doc is reading!). I know I've posted a few pictures of this particular sunset before but I hadn't put it through some of the more up-to-date software I now have thanks to being on broadband at last. Somewhere in one of my closets are a few pictures of a staggering sunset I saw in South Africa many years ago; I hope I can find them again and perhaps digitize them. Still, they don't compare to the best sunset I have ever seen which was in July this year. It's the evening I took the panorama for my current blog header and whenever I look at the dozens of pictures I took that evening I know I witnessed a very special sight. There has been an interesting discussion in one of the blogs I follow - the Big Island Chronicle. It's one of the best blogs out there, especially for those of us who live on the Big Island of Hawai`i. One recent post has resulted in several comments, many of which are suspect as there was a deluge of anonymous comments all saying the same thing, but this person's comments really caught my attention. butlincat, like many UFO/chemtrail/911 conspiracy theorists loves to draw attention away from the nonsense they post by including numerous videos, pictures and bright colours that do nothing other than distract readers from the lack of evidence or verifiable facts that they present. You only have to look at his blog to to see it's just another conspiracy theorist who loves to deluge the reader with frighteningly bright colours. I've commented a few times in the the Big Island Chronicle's article and expressed some of my views. As I expected, some of the comments have been met with some very strange replies and as usual a bunch of insults. Butlincat thinks I called him an imbecile when in fact I never said such a thing, but in return I'm a foolish ignorant sheep. I've issued a challenge to Butlincat. He says the US borders will be closed by 31st December this year and I say they won't. I've given my word that I'll admit I'm wrong if indeed the borders do close and challenged butlincat to do the same if he is wrong. That's when he came out with the insults. So, here it is again, butlincat, but it's my blog this time. I'll say I'm wrong if the US closes its borders on 31 Dec and if they don't, you'll say you're wrong. Deal? Update: butlincat's latest response to my challenge in the Big Island Chronicle's article is "go away". So much for standing up for what you believe in. This is just another conspiracy theorist who runs away when given the opportunity to present evidence to support their case and hasn't got the guts to stand behind their own claims. What a surprise. I tried to find the Oshiro family Christmas light show last year without success. I think I found the right place but it was late at night and I think the lights had been turned off. I'm definitely going to try again this year as it's not far away from me at all. I have to say I don't envy the utility bill they'll be getting in January, but it's an extraordinary show! More videos can be found here. 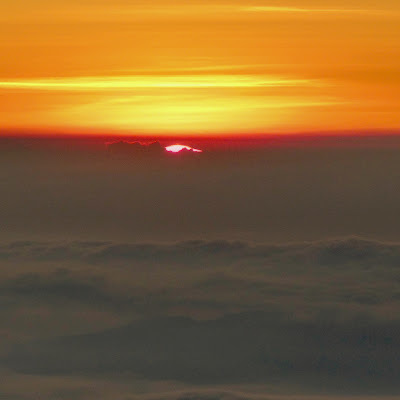 I won't be showing too many more summit sunset pictures for a while I think and suspect that my blog might go into a relatively quiet period for a couple of months. I'm not scheduled for the night shift again until the end of January and I'm taking a bit of leave during January as well - it's been almost a year since I last took any significant time away from work and am really looking forward to it! 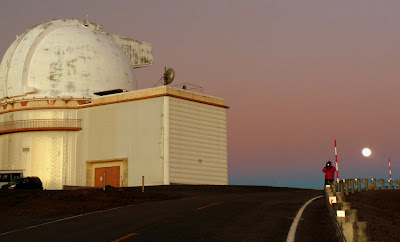 In the meantime I'm now moving to the day shift and will still be visiting Mauna Kea's summit once in a while with the engineers and technicians but I have to admit the opportunities to take pictures up there are a little more limited during the day, but I'll see what I can do! In fact I was hoping to take a bunch of photos today showing the massive surf that was forecast to hit us late today, but when I went down to the nearby cliffs the ocean was like a mill pond. North Oahu is forecast to be hit by an unbelievably massive surf overnight and over the next couple of days. Wave heights of up to 50-feet are expected and some reports seem to indicate the surf may be as high as 60-feet in some sets. That's truly hard to imagine. I've seen 25 to 30-foot waves and that was one of the most awesome sights I have seen - I can't quite picture what waves double that height might look like. There will be surfers out in that ocean violence as well, but only the most experienced. It looks good for the Eddie Aikau Quicksilver surf contest tomorrow, the most prestigious one in the world which is only held when the surf gets this big! Down here on the Big Island we get shielded from these massive north west swells by the other islands but the forecast is still calling for some truly large surf, even for the cliffs near me - perhaps up to 20-foot waves. I'll have another look tomorrow evening when I get back from work and if I don't check in you might want to call the US Coast Guard! I don't actually know this guy's name so I'm calling him Norman for now. 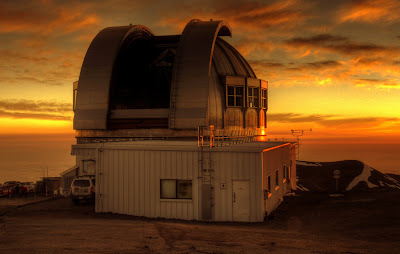 He's a mascot of The University of Nottingham Astronomy Group and he's currently observing at the summit of Mauna Kea. Apparently he accompanies astronomers from the group all over the world when they go observing and tries to help at night although I found him a little unresponsive when I gave him the safety briefing and explained how to use our telescope. He seems to be a little short-sighted as well but at least he tried to fit in by wearing his aloha shirt and sunglasses despite not being appropriate clothing for the summit. He's been here before so he ought to have known about the requirement for wearing cold weather gear. Still, it's always a pleasure to see Norman again. I can't strictly call The University of Nottingham my alma mater since I was wasn't a student there, but I did spend two-and-a-half years in Nottingham as a postdoc although this was before there was an astronomy group at the university - I worked in the chemistry department for a small but very active astrophysical chemistry research group which is still going strong I'm very pleased to say. It was a fun two years and I love Nottingham despite some of the problems the city has had over the last few years and I have to say the university campus has to be among the most beautiful anywhere in the UK. I return fairly regularly as I still collaborate with university staff and still have many good and dear friends there. Of course it's always a real pleasure to have them out in Hawai`i visiting us! A moonlit panorama of Mauna Kea's summit area taken at 3:20 in the morning believe it or not. This is always the worst part of the night. The body and brain want to sleep so badly and often I'll step outside into the freezing night-time temperatures just to wake myself up. When the sky is clear and there's no moon the sky can be dramatic, you hardly need to get dark adapted to see the Milky Way and a sky full of stars. On the other hand when the moon is up the night sky can look quite dull but then you get to see the rest of the mountain and the observatories at work. When the wind is calm it's very quiet except for the occasional distant hum of a telescope slewing. This is always the time and view that reminds me of how remote we are as an island and also as a planet. From left to right: the Hualalai volcano and then Pu`u Poli`ahu which legend has it is the home of the snow goddess of Mauna Kea. In the shadow of Poli`ahu are the CSO, JCMT and the SMA. On the ridge the Subaru and twin Kecks are visible with Maui's Haleakala in the far distance. When the inversion layer is low the summit of Mauna Loa and its western slopes are visible from my home away from home. Unfortunately we don't have too many windows to look through at the summit as the other observatories might get a little annoyed whenever we turn the lights on. Those wanting to take photos of the summit views have to step outside and brave the cold and wind, but it's worth it. The vog and clouds in the saddle between Mauna Kea and Mauna Loa always fascinate me. Click on the picture to get a closer view of them. There was a flurry of comments in a post of mine and wondered if I'd said something controversial or perhaps mentioned Tiger Woods by accident. Turns out it was thanks to a post by Hilary over at "The Smitten Image" who is under the impression that I wrote something interesting. In a sudden fit of altitude-induced scientific curiosity, I checked google analytics to see where these comments had come from. I don't do that very often because this blog is essentially my diary, it just happens to be online and people are welcome to read it. On the other hand, I learned something very interesting tonight. 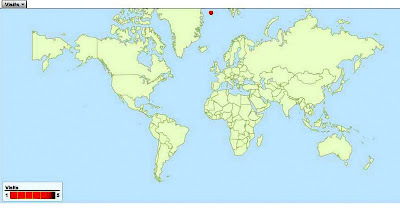 Apparently there is only one person who reads this blog and therefore, according to google and the internet (from which everything that is true emerges) they live well north of the Arctic circle a few hundred miles offshore of Greenland's east coast. I'm impressed by the number of personalities this person has used when commenting on my blog! So, to my reader out there in a trawler or lightship, perhaps the captain of a stranded Russian nuclear submarine or maybe a polar explorer stuck in the ice with their ship crushed by mother nature and with his friends frozen to death or eaten by polar bears, I'd like to thank you for taking the time to read my blog. Do you need me to send a rescue team? It's from the internet, it must be true. 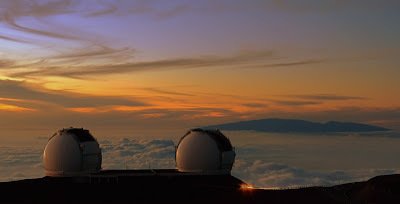 Over thirteen years of working on Mauna Kea, eighteen since I first visited and over a thousand nights spent on the summit and I have yet to see the green flash from the mountain. 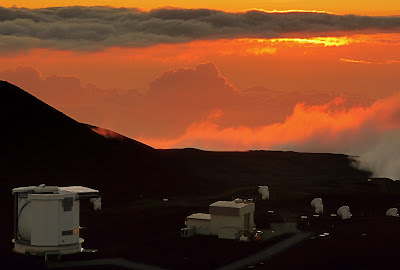 Even more frustratingly, I know it's occurred while I've been outside watching the sunset because someone on their first trip to Mauna Kea, just a week and a half ago, caught it photographically and decided to rub salt into my wounds by publishing it on Facebook! I was there that night and gave the guy a lift back down. Grrr. I should have stolen his camera and left him at the summit!